Oakland has a long and fascinating history. Come along with Oakland North as we explore some of the city’s most interesting old stories in text and photos. Then, we take a look back at the Golden Gate neighborhood. The area north of Emeryville, centered around San Pablo Avenue and 59th Street, has had many faces over the years. A thriving commercial strip. Open country, with dairy farms, cottages and ranches. A small town created by an eccentric showman remembered for his multi-colored jackasses. A tavern haven. We explore them all in this special project. We did a walking tour of Oakland’s historic churches, as well as a special project on Oakland’s Buddhist Church, one of the last remaining physical structures from Oakland’s Japanese-American community that lived in Chinatown before World War II. If you’re interested in Oakland’s most historic cemetery, try Mountain View: A tour for the living as well as our profile of Mountain View’s tombstone engravers. We also did a story on the installation of a memorial in an Oakland cemetery for the Peoples Temple members who died in 1978 in the mass suicide at Jonestown. Remember the Bay Area’s original mass transit system, the Key Car system? Check out Forgotten Trains of the Bay Area. And while you’re at it, you might like our interactive history of the Bay Bridge: Bridge to Nowhere. And don’t forget one of the Bay Area’s original forms of transportation — the horse! We made a video about the Oakland Black Cowboys’ Association and their role in the development of the American West. Don’t forget to try our special interactive history project with the game So You Think You Know Lake Merritt? Take the quiz and test your knowledge! We dove down deep to cover the history of one very special Oakland intersection: 51st and Telegraph. We also did a special project on the protest movements of the 1960s and 1970s, looking at the history of the Black Panthers and the Native American, Asian and Chicano Power Movements: Many Movements, One Struggle. And while we’re talking about the 1960s, you should definitely take a stop at Oakland’s historic tiki lounges. We move into the more modern era with our special news package documenting the 1991 Oakland Hills fire, and the changes it wrought on the area 20 years later. Learn about some of the special possessions fire survivors saved, about the changing architecture of the area after homes were rebuilt, and about how fire gear and environmental policies have changed since the fire. 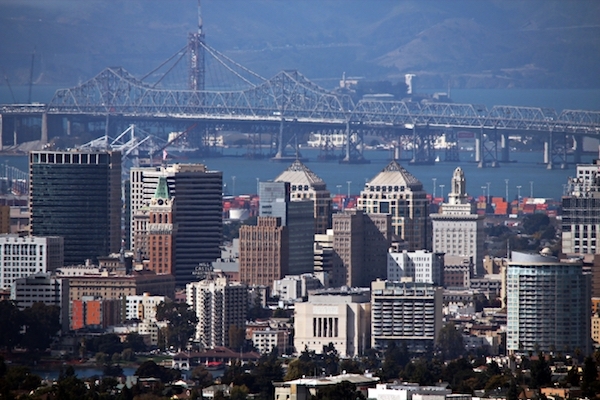 Can you farm in a city like Oakland? We put together a special multimedia package on the history of growing and producing food in Oakland — check it out at Regrowing Oakland: The Future of Urban Food. And how about a (less healthy) Oakland classic? A tribute to Kasper’s: History, in hot dogs. Or the beloved Neldam’s Danish bakery, which was reopened in 2010 as a collective bakery with the new name, A Taste of Denmark. Here’s a classic of another kind: Everything Old is New Again: Dec-O-Win at the Paramount Theatre. And another beloved movie theater: The Parkway’s Last Hurrah. And here are some people who are bringing a classic back: Top Hat and Tails, a Vintage Base Ball Story. And finally, it wouldn’t be a historical celebration without mentioning some of the great — and absurd — inventions that have been attributed to Oaklanders. See our project that sorts the factual from the fictious with Invented in Oakland.